Want to be notified of new releases in wildbit/postmark_webhooks? This project is a quick start app you can use to host your own URLs for receiving, storing, processing, and viewing webhooks sent from Postmark. It is written in Meteor.js due to the framework's ability to quickly display server side data without needing a refresh in the browser. Be sure to read the Postmark webhooks documentation. Use the deploy to Heroku button (you can host it somewhere else if you want, like Galaxy) and begin taking advantage of Postmark's Open tracking webhook, Bounce webhook, Click webhook, Delivery Webhook, and Inbound webhook. If you have not already done so, sign up for a Postmark account here. Receive webhook POSTs (well formatted JSON) from Postmark for Bounces, Opens, Clicks, Delivery events, and Inbound messages, with minimal development/configuration effort on your part. Automatically send notification emails (using Postmark) to yourself and/or others when you receive a new bounce, open, click, delivery event, or inbound message. Searchable so you can easily find and view details of a specific bounce, open event, click event, delivery event, or inbound message. 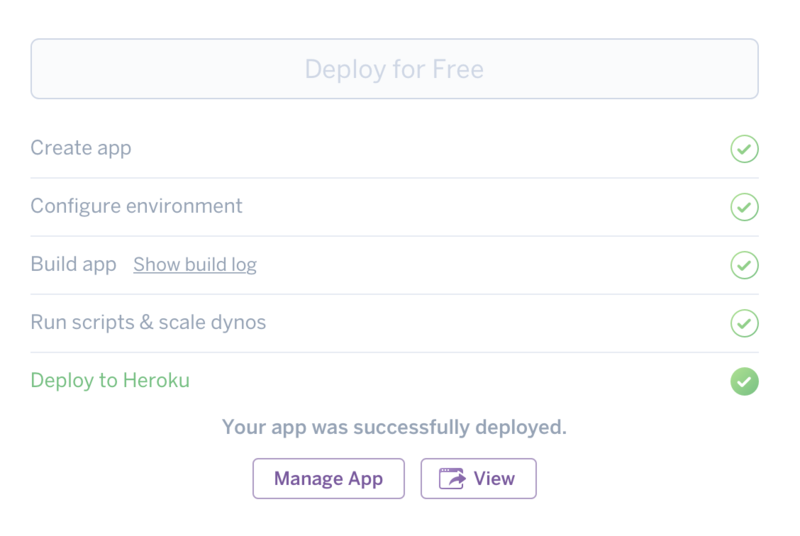 Use the Deploy to Heroku button at the top of this page to quickly host your own instance of the app. Once you have entered in your custom name and ROOT_URL, you can proceed to deploy the app to Heroku by clicking Deploy for Free. Once completed, click View to open your new app on the web. Our next step is to configure our server(s) in Postmark with the new URLs we have available for receiving webhooks. Setting these URLs tells in Postmark determines where to send the webhook events. Use the following URLs, where yourappname.herokuapp.com is replaced with your webhook receiving app's root domain. From your server's Webhooks tab in Postmark, follow these steps for each webhook type you want to use. 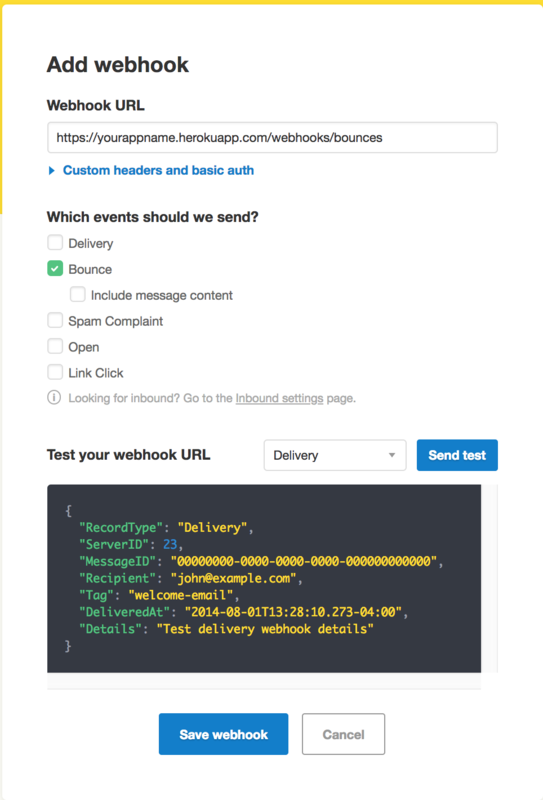 Enter in the appropriate URL for that event (use your Bounces webhook URL when setting up the Bounces webhook, for example). Deploying to Heroku sets you up with an mLab MongoDB account with their free sandbox plan. You can upgrade your mLab MongoDB plan in Heroku if you need additional storage. Upgrade your mLab MongoDB plan if you plan to use this heavily in production as their sandbox instances do not include redundancy for their databases. Only Postmark's listed IPs for webhooks can POST to URLs built by this app. Any other received request is ignored and no document is added to the collections in the database. Received data is also validated against a schema to ensure appropriate data received and stored as a document in its associated collection. In addition to receiving and processing Postmark webhooks, this app also allows for you to send emails using Postmark when you receive a bounce, open event, delivery event, or inbound message. Open up server/settings.js to view and modify the settings. Set the From email addresses for your notifications to email addresses that you have added as Sender Signatures or are on your verified domains in Postmark to be sure you are able to send notification emails. These notification emails can be sent to any recipient.